Allscape has published many landscaping articles that help home owners make better decision. The 2012 drought was the worst Illinois has seen in a long time. But the way this winter is going the Illinois landscape is going to be water deprived again this spring. Global warming surely seems to be a reality in Illinois. There is no doubt that having a lawn sprinkler system this year will guarantee that there will be no drought damage on your property. Every year I talk to thousands of people about lawn sprinkler systems. I have listed below the most frequently asked questions. A. No. – if you are already pulling a hose around your yard to water then a lawn sprinkler system will actually save you water, because it will water your landscape better, and more efficiently than you can with a hose, Especially if you leave it running too long in an area. It is required that all lawn sprinkler systems have a rain sensor to shut down the system when it rains. State of the art lawn sprinkler systems have a smart controller with a rain sensor and weather station. These smart controller systems will actually measure rain fall, temperature, and sunlight, then calculate exactly how much water your property needs, and change the sprinkler run times daily so that you never over or under water. Q. Does having a lawn sprinkler system really save me time? A. Yes. -- If you are dragging hoses to water your property on a regular basis then you know that to water evenly across the whole property take hours of scheduled moving hose at least 2 times per week. A. there is no way you can water as efficiently and most likely as often as your landscape will need to be its healthiest. Q. We generally get 40 or more inches of rainfall a year. Do we really need a lawn sprinkler system? A. -- Unfortunately, there is no way that nature will rain on schedule. Your landscape needs to be watered at least every three days to be its healthiest. On big rains most of the water just runs off your property. A. -- Depending on your water source components can differ. Lake pump sprinkler systems require a pump, pump start relay, and filter to supply the water. Cities with low water pressure may need a booster pump to help supply water. After water is supplied you need an r p z (back flow prevention device). After that you need a main water line with sprinkler cable run around the property to each valve that the system will require. Then lateral lines run from the valves to the head positions and finally head to spray water. A, -- yes you can build your own system. But it is very labor intensive. Even more so if you are trenching for the piping by hand. The second reservation is water pressure. Every house is different. Water flow and pressure decide how many heads can go on a single zone. Lawn sprinkler design is a science and you cannot exceed the flow and pressure that you have available or your lawn sprinkler system will not work properly. I highly recommend at least paying for a consultation with a certified irrigation contractor to help design and guide you through the install. A. -- yes, you can save on the labor if you don't count your time as money. A lawn sprinkler system built by a contractor with 4 employees and a vibrating plow can be completed in one 8 hour day. One built by a home owner by himself renting a vibrating plow for $500 would take 6, to 8, 8 hour days. Use an Illinois registered irrigation contractor with a company that has been in business for more than 7 years. Make sure that they are willing to pull permits for the job. Get an estimate of cost and go over details like how many heads, what type of heads, drip zones, over spray or dedicated watering, how many valves, how many heads per zone, what type of connections are they using, are they installing a smart controller with a weather station or just a rain sensor, how long is the warranty and does it include labor, what are the maintenance fees. A. the average ¼ acre home will fall between $3,400 to $4,000 depending on many factors, like type of landscaping, dedicated watering or overspray, Pressure and flow, city requirements, smart clock or rain sensor, and customer preferences. A. No the lawn sprinkler systems today are easy to use and with the addition of a smart clock don't have to be adjusted at all. Q. Where can I go for more information about installing and maintaining my automatic sprinkler system? A. Visit our main Landscape Design Website. 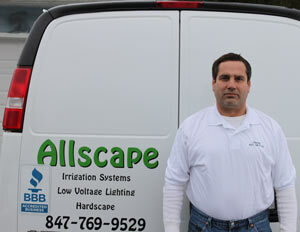 Allscape Inc. was started in 1997 with the vision that one day we would have a full service landscape company. We started out by installing and servicing irrigation systems, and low voltage lighting. I believe the reason for our success is that we slowly added services, so that we never lost control over the quality of our service. Today we can truly say that we are the premier landscape company in Northern IL. Allscape landscaping articles help home owners make better decision. They can be found on Allscape's design website Illinois Landscaping Aticles.